Graham qualified at St. Thomas’ Hospital, London in 1996. He trained in radiology at St. George’s Hospital, London. In 2004 he spent a year at McMaster University in Canada on a Musculoskeletal Radiology Fellowship, returning to the UK to start his Consultant post at the Royal United Hospital, Bath. His major areas of interest are musculoskeletal, sports and chest imaging. 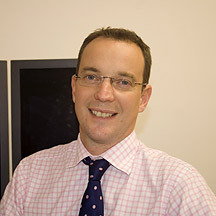 He is a member of the British Society of Skeletal Radiologists and the British Society of Thoracic Imaging. He also works at the Royal National Hospital for Rheumatic Disease. With his musculoskeletal colleagues he performs imaging and intervention for all sports, musculoskeletal and rheumatological disorders. He provides services to elite sports persons, including Bath Rugby and athletes from the English Institute of Sport. Within chest imaging he has specific interests in interstitial lung disease and pulmonary hypertension.